Why does my crystal keep manifesting diamond windows? "Hello. I have a crystal that I received from your store, that appears to have morphed several times over the past several days. I know that this is a very special crystal and am trying to understand why it keeps manifesting diamond windows; currently it is up to 3. Thank you!" Your query really has us stumped here so I'm going to do my best and answer you with what I know. According to our Formations Guide about Diamond Window Formations: "It can be a four sided vertical Diamond shaped face as one of the main six faces (Rare) or between and slightly lower than the six main faces, making it the Seventh Face (Uncommon). This type of crystal allow us to see the spirit realms and leads us within. It is literally a window to the soul, as it assists us in receiving intuitive answers to questions while bypassing ego and/or intellect. 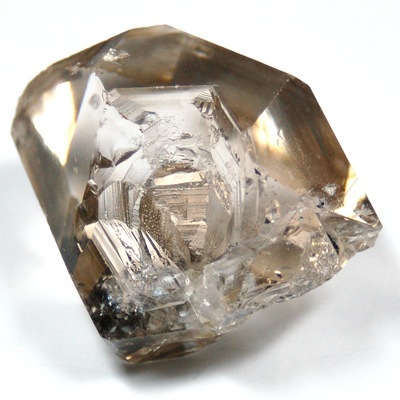 The Diamond faced crystal can assist the balance between the Spiritual world and the material world. It provides a doorway (or window) into other levels of be-ing and a deep connection with Self." Knowing this and the crystal being a window into the soul, I would sit down with the crystal and try to access the window. The crystal may have a specific message to share with YOU that only you can access and that's why it keeps manifesting windows. When you sit down to meditate with the crystal, look at the crystal and memorise how it looks and feels, especially one of the windows. You could then close your eyes and try visualising in your meditation, you climbing through one of the diamond windows and see what the crystal can share with you. To take it a little further, you can take a look at what the number 3 means. To me, three is a very special number because 1 + 1 = 3 in the sense of take me (1) + a crystal (1) and together (=) we take a journey and something magical can happen (3). I hope this makes sense. Take a look at the meaning of the number 3 as well as Diamond Window Formations, and what that means to you. I do 100% recommend sitting down with the crystal and spending time with it in order to uncover the message and why it keeps forming diamond windows. Often what you find in books or from others, doesn't always correspond to what the crystal has to share with you. I hope that this offers you some clarity.